The death toll from rocket attacks on the southeastern city of Kilis increased to three, media outlets reported on Saturday. Five rockets fired from Syria fell in Kilis city center near the border on Friday, killing initially two and injuring four people, but as one of the injured succumbed to injuries, the death toll eventually increased to three. The third victim was Mahmut Emre Arslan, 14, who passed away at Kilis State Hospital, a medical source reportedly told state-run Anadolu Agency (AA), on condition of anonymity due to restrictions on speaking to the media. Five Katyusha rockets fired from the Daesh controlled al-Bab town in northern Syria fell into an empty field and residential areas in southern Kilis province on the border with Syria. 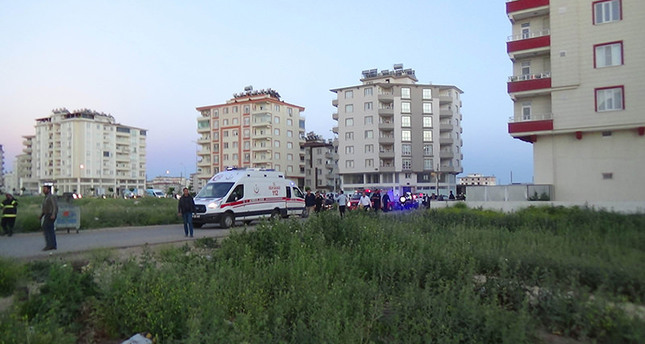 Three of the rockets hit residential areas in the neighborhoods of Yavuz Sultan Selim and Mehmet Rıfat Kazancıoğlu later in the evening around 07:00 p.m. Six people were injured by shrapnel pieces. The first two rockets did not cause any injuries or casualties, while a car was slightly damaged. Police units arrived at the scene to pick up the pieces of the rockets to be examined for the investigation. One of the rockets fell just 20 meters away from a building where Syrian refugee children were taking temporary courses and 150 students were reportedly inside the building when the rockets landed. Turkish artillery batteries fired retaliatory shells into al-Bab. Meanwhile, an elderly Turkish man who was wounded Monday's rocket attack died Friday, bringing the death toll of the attack to five. Abbas Çelik, 74, was among 12 people who were injured when three rockets fired from Daesh-controlled territory in Syria on April 11 landed in a residential area. Four Syrian nationals, including three children, were killed in Monday's attacks. According to the source, who spoke on condition of anonymity because of restrictions on talking to the media, said his body had been transferred from Kilis State Hospital to Gaziantep Forensic Medicine Institution to determine the cause of death. The distance between Kilis city center and the Syrian border is less than four kilometers in some areas. The rockets are believed to have been fired from a Daesh-controlled region in Syria, where Daesh and Syrian opposition have been fighting to expand their control over the territory between the towns of Azaz and al-Rai since early April. Occasional stray rockets and mortars land in southern and southeastern Turkey due to the conflict in neighboring Syria. Despite a ceasefire in the country, violence still persists in the area. Kilis, which is home to large numbers of Syrian refugees exceeding its own population, has suffered repeatedly from cross-border shelling. The rockets became an almost daily occasion in the small town where locals recently rallied for more security measures. Under Turkey's rules of engagement, the military responds immediately by shelling Daesh positions in Syria.